Changing accountants, changing accountants in cork. Crazy isn’t it? Well, yes. And no. You see, many business people still see their relationship with their accountant as a very personal one, and rightly so. Usually something really drastic has to happen to make them move. There’s also a common perception that all accountants are the same. They all have a qualification and they all produce the same set of accounts at the end of the year. They are a necessary expense that every business has to endure. This article looks at the top six reasons people stay with their existing accountant and challenges those misconceptions. One of the most common reasons for sticking with a current firm is that they are local. Of course these days thanks to ever-improving online technologies, accountants don’t need to be on your doorstep to give you great service. They can work from anywhere. They can be in the Outer Hebrides and do all your accounting/ bookkeeping, and give you as much advice as you need by email or phone. You can even have regular video-conferences or skype calls so they are involved in your business, almost like a virtual FD. All relationships require trust from both sides and not least the area of accounting and financial planning. We are a professionally qualified firm with a proven track record working with clients of all sizes. When working through our Easy-change programme we will explain our experience, qualifications and structure so that you can trust us and our entire team. Reluctance to change is understandable, but recognising the benefits of change is essential. Without reviewing other alternatives you simply do not know what you are missing out on. We recognise this and have developed a unique Easy-change programme which will minimise interruption and irritation for YOU. This programme enables our team to learn the essentials of your business and how to improve the current process with minimal irritation and upheaval from you. Any short term investment of time from you will be more than compensated for by new ideas and new focus on your profitability. The truth is you are almost certainly paying more for this ‘cheap bill’ through poor strategic advice, inflated tax bills, little or no financial planning and potentially woeful business systems. If your view is truthfully to pay the least possible for the minimum you can get away with – we are probably not right for each other. However if you have simply paid a low fee to your current firm because you didn’t know what else was on offer we would love the opportunity to meet with you. 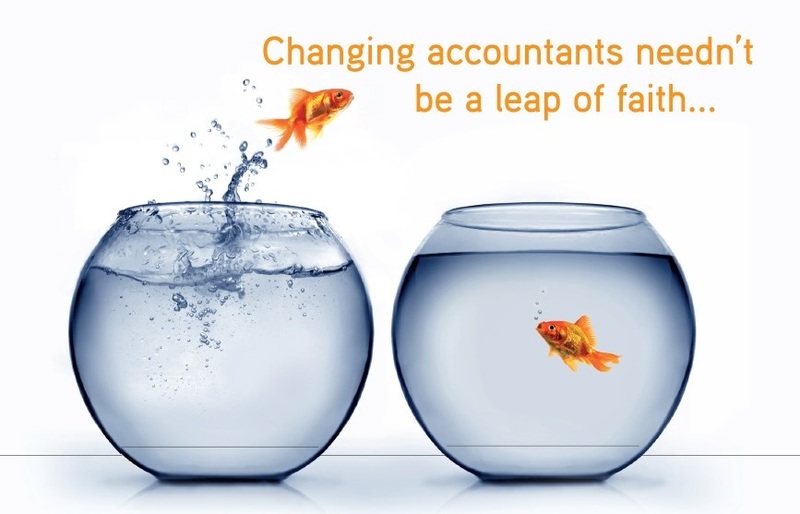 Our unique process to changing accountancy firms. Get a great accountant – step 1: We will contact your current accountant (so you don’t have any embarrassing goodbyes!) and explain that you are moving your business to Charles P Crowley & Co. We’ll even draft a brief note from you to your old accountants to confirm the move. We let the powers that be know for you – step 4: We will advise the Irish Revenue or HMRC and any other government offices that we’re looking after your affairs. Change is a vital part of long-term commercial success. By making changes, you’ll make breakthroughs; you’ll see different, better and more profitable ways of doing things in the short term whilst planning deliberately for the long term. Every company wants to do more than just survive, it needs to be competitive. Lack of change often leads to complacency and in the mistaken belief that you are currently getting the best available service from your accountant, you miss out on new, more exciting and more profitable opportunities. Take the initiative and call us on 023-8841899 or email caroline@charlespcrowley.com for a totally free consultation or a free quote. At Charles P Crowley & Co we understand the difficulties associated with change and will help you work through them. We also recognise the significant benefits you will receive by changing to a more future-focused, business-orientated accountancy firm, a firm which will help you reach your business and personal goals more quickly and more profitably.